This web page took over an hour to scan, research, design, and upload. Thank you for supporting the Virtual Steam Car Museum! The Judson L. Thomson Manufacturing Company produced aftermarket burners for steam automobiles. 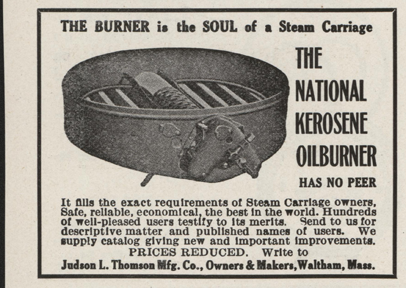 Judson L. Thomson's advertisement carries the title "The Burner is the Soul of a Steam Carriage." It appeared in the November 1907 issue of Cycle and Automobile Trade Journal. John A. Conde Collection. 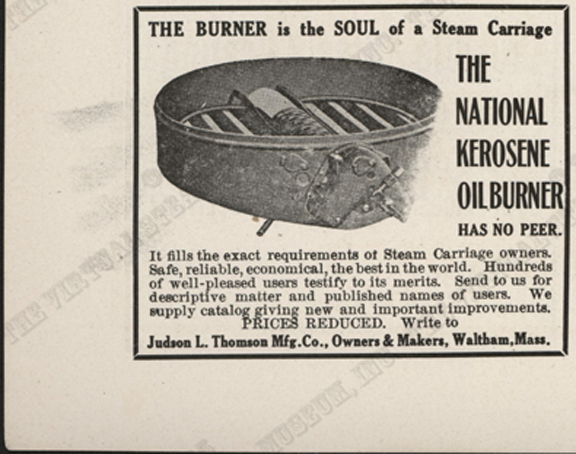 Judson L. Thomson's advertisement carries the title "The Burner is the Soul of a Steam Carriage." It appeared in the April 1910 issue of Cycle and Automobile Trade Journal, a testament to the number of steam cars still on the road in 1910. John A. Conde Collection. Contact us if you have additional information about the Judson L. Thomson Manufacturing Company, or if you have questions.